Smart women understand that taking care of their health is essential to maintaining an active lifestyle. This comprehensive guide shows you how to work with your body instead of against it to stay healthy and happy through menopause and beyond. 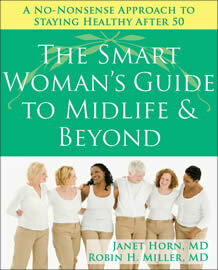 Written by two practicing doctors who have been close girlfriends since they met during medical training at the Johns Hopkins Hospital, The Smart Woman's Guide to Midlife and Beyond includes the doctors' own personal experiences, patient stories from their medical practices, and all the information you need to age with good health, grace, and humor. A lot of health books cross our desks each year, but few have done a better job of grabbing our attention than "The Smart Woman's Guide to Midlife and Beyond." The authors -- Janet Horn and Robin H. Miller, both physicians -- open with this passage: "Let us be right up front as you start reading. This book is not about becoming young again." Rather, the two explain that women "can stay healthy by working along with [their] bodies as they change with time, not fighting against them." In addition to information about fitness, diet, mental health and common illnesses, the authors write about their personal health experiences, share stories from their work with patients and provide a "Health Maintenance Schedule" to help readers monitor their progress. It's a terrific resource -- and a wonderful read. Home | Janet Horn, M.D. Copyright ©2008 Janet Horn, M.D. & Robin H. Miller, M.D.